The Hamilton Shines Billboard Art Contest winners for this year include three Hamilton County students. Mayor Jim Coppinger recognized each at their school and presented the winners a plaque, pin and a poster rendition of their billboard. The artwork will be displayed on a billboard in the community located near each winner’s school. The elementary school division winner is Emma Hornsby, a fifth grade Orchard Knob Elementary student. The middle school division winner is Lachi Tate, an eighth grade student at East Lake Academy. The high school division winner is Evan Mauldin, an 11th grade student at Ooltewah High School. 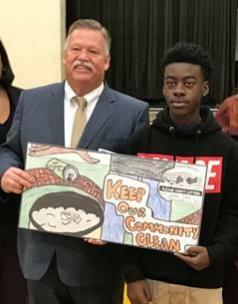 The purpose of the Hamilton Shines Billboard Art competition is to "encourage students to express themselves, be creative and affect change in the community by reducing littering through education." The Hamilton Shines Billboard Art Contest is co-sponsored by the Scenic Cities Beautiful Commission in cooperation with the Hamilton County Schools.